So here I am, with snow on the ground, making more ice cream. My daughter asked for the "minty" ice cream. We JUST finished the last of the 5 different quarts of ice cream we made for her ice-cream themed birthday party, so I was totally prepared with my captain-no-fun-mom response of N-O. Then it dawned on me.......hey....it's March. March means St. Patrick's Day. Green minty ice cream would be so festive. And you know what would amp up the festiveness even more? Rainbow chocolaty bits! 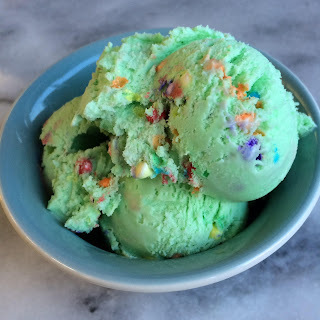 I also have an abundance of this item in my pantry due to the ice cream themed birthday party that took place in mid-January. (See....Ice cream has no season!) Buckle up everyone, this is gonna blow your mind. The recipe below is for a half batch, which is actually perfect because after it churns it makes just under 3 cups. That is the perfect amount to have a treat, but not have it linger in your freezer and tempting you every night after the kids go to bed. That is serious business. -Green food coloring paste (such as Wilton), as desired. -Pour the mixture into an ice cream maker and process according to manufacturer's directions. Mine takes about 25 to 30 minutes. Just before it is complete, slowly pour in sprinkles and process just until combined. Don't add them too early, or the colors will run. -Transfer to an airtight container and freeze for approximately 4 hours, until firm.